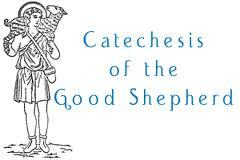 Catechesis of the Good Shepherd is a Montessori based program of catechesis, for three through six year old children. The classroom, called the Atrium, is a place where the children encounter Christ together with the catechist. It is the joy of the children’s encounter with God that developed the curriculum that has become the Catechesis of the Good Shepherd. The main goal of the Atrium is that through the work of their hands, the children will come to fall in love with Jesus, the Good Shepherd. This year it will continue to be held on Thursday mornings beginning at 9:40 like the regular classes. Register your child through the Religious Education registration page. For more information, contact Nikki Hollister at 717.392.2578 and see the links below.